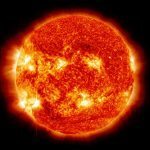 The most well-documented connection between the sun and Earth effects, other than the total sunlight, is in the cosmic rays received. This plot shows that the sunspot cycle (yellow) is anti-correlated with the cosmic rays (blue) detected at the station at Climax, Colorado. It is believed that this is caused by the solar magnetic field being stronger at solar maximum, which lets fewer cosmic rays penetrate into Earth’s atmosphere, hence cosmic rays are at a minimum when solar activity is at a maximum. The sunspot cycle and Cosmic Rays…. There is a well-known anti-correlation between times of sunspot maxima and times of maximum cosmic ray detections at ground stations. 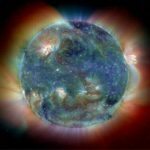 This relationship is now understood to be due to the solar magnetic field providing more shielding to the inner solar system at sunspot maximum, so that fewer cosmic rays reach earth. This resource at the NOAA National Geophysical Data Center gives some details. The sunspot cycle and Cosmic Rays… This study in 2000 by E. Palle Bago and C. J. Butler at Armagh Observatory was published in the journal Astronomy and Geophysics (vol. 41 pg 18) and used satellite cloud cover data for the period from 1983 to 1994. They were able to detect a statistically significant correlation between the low-level cloud cover and the solar cycle. 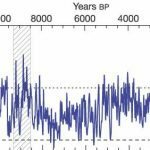 This correlation seems to vanish after 1991 when it is widely believed that non-solar factors such as Global Warming have been the main driver of climate changes. The sunspot cycle, Cosmic Rays and Cloud Cover…. This study by Ken Carslaw at the University of Leeds published in the November 29, 2002 issue of the journal Science (page 1732) describes a simulation experiment at CERN to investigate how cosmic rays can influence water droplet condensation which leads to the correlation established between cloud cover and cosmic rays. The sunspot cycle and Cloud Cover…. This 1997 study by Svensmark and Friss-Christensen was published in the journal Atmospheric, Solar and Terrestrial Physics. It is considered by many researchers as the first clear indication that cloud cover varies in cycle with cosmic ray intensities suggesting a close cause-and-effect-relationship. Because cosmic rays are anti-correlated with the 11-year sunspot cycle, this predicts that cloud cover is modulated by solar activity in a non-direct way.